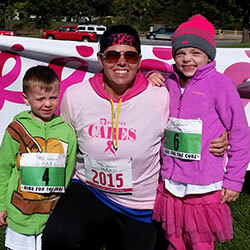 A team of employees from Quester recently participated in the Susan G. Komen Race for the Cure in downtown Des Moines. 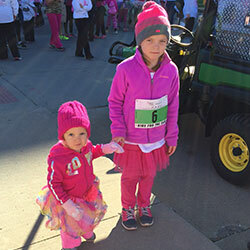 Sporting their pink Quester Cares t-shirts, this team, along with some of their adorable kids, showed their support for breast cancer research by walking and running with more than 10,000 participants in this year’s race on Saturday, October 4. Braving the brisk weather, some of the team members walked in memory of family members who have lost the battle with breast cancer while others were there to support someone they know who is recently hoping that a cure for breast cancer is soon discovered. Those Quester employees who participated represented a new program in the company called Quester Cares. This program was developed to help support organizations, mainly non-profit groups, that do amazing work but choose to forego marketing research because they want to dedicate all of their resources to helping the people or causes they serve. Quester Cares, whose motto reads – “serving the greater good by helping those who do the greatest good”- allows these organizations to utilize Quester’s innovative technology to communicate their message more effectively without having to spend precious time and funds. To learn more about Quester Cares visit our website at http://www.quester.com/news/quester-cares.